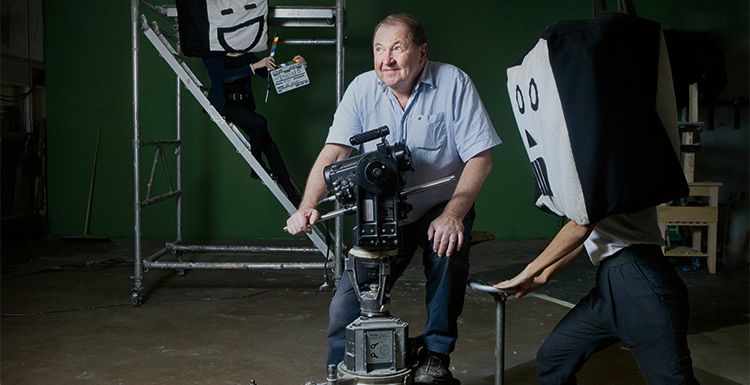 Considered one of Northern Europe’s most renowned art film directors to date, Swedish filmmaker Roy Andersson has been hailed by critics and art cinemagoers alike for his unconventional visual and narrative style. Marked by his use of long, static shots filmed in wide-angle and deep focus, Andersson’s “tableau aesthetic” is intimately linked to his idea that films, like other art forms, can have an important function in contemporary society: to provoke social and moral awareness in its audience. Aiming to counter what he considers a “fear of seriousness” and a dearth of critical contemplation in modern society and media, Andersson uses his films and his distinct tableau aesthetic to explore the key social, political and philosophical issues of our times: the human condition, the problems of modernity, and the lingering legacy of past historical traumas. His Living Trilogy of films began in 2000, takes stock of what it means to be a human being. What is human existence? In each Living Trilogy instalment, brief but complete scenes pose questions about awareness, responsibility, and the weight of history in contemporary life. Even Andersson’s most farfetched images, often addressing the exploitative legacies of fascism, Nazism, and ethnic cleansing shared by all in the West, are disturbingly familiar. Over the span of fifteen years, each succeeding film was made in a largely consistent style that strives to close the paradoxical gap between dream and reality. Despite his dense material, Andersson’s touch is light, the occasionally farcical tone sympathetically mordant. 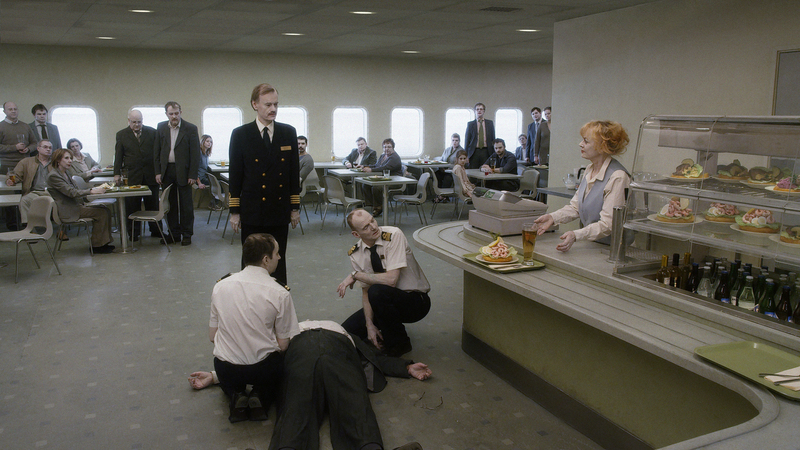 Sharply lampooning society’s rules, expectations, and institutions, Andersson reserves his benevolence for flops and lost causes. His distinctive art style of long takes, static shots, greyed-out palette and a kind of visual stillness blended with absurd events, is the mark of a unique filmmaker. Andersson has himself spoken about his preference for “hyperreality”, filming each set from a single camera position in order to create static vignettes packed with details. It’s an approach naturally informed by his creation of over 400 adverts. Despite their distinctive appeal, Roy Andersson’s films are rarely screened in Iceland, which will make a Nordic Film Festival‘s showcase of his shorts and feature film ‘living trilogy’ a very special experience. Accompanying the screening of his oeuvre over the course of 4 days, the exhibition I´m happy to hear that you’re doing fine, which focuses primarily on material from the trilogy will be on display in the Nordic house. Entrance to the films is free and free tickets will be available soon in tix.is here on the Nordic House home page. The movies are in Swedish with English subtitles. You, the Living is a ﬁlm about man’s existence, about the doings of man, about man’s behaviour, about man’s ponderings, about man’s concerns, about man’s dreams, about man’s sorrow, about man’s joy and about man’s inexhaustible longing for validation and love. Following Songs from the Second Floor and You, the Living, Roy Andersson’s award-winning film (Best Film, Venice 2014) forms the third part of a loose trilogy about life, death and what it means to be a human being. Sam and Jonathan are two travelling salesmen peddling novelty items – mostly unsuccessfully. Like modern-day Don Quixote and Sancho, they take us on a kaleidoscopic journey through multiple human destinies. It is a trip that shows us beauty in one moment, pettiness in another and the humour and tragedy within us all. One that evokes the grandeur of life as well as the ultimate frailty of humanity. By turns tragic, absurd, meditative and hilarious his work has drawn comparisons with Samuel Beckett, Monty Python, Ingmar Bergman and Laurel & Hardy, but in truth is utterly unique. Pulling together all the various strands of his previous films into a cohesive, resolved whole, A Pigeon… is the culmination of one of modern cinema’s greatest talents and is nothing short of a masterpiece. Two idealistic teenagers fall in love for the first time in this romantic drama. They try to remain hopeful in a cynical world of adults that discourage them. Their parents are weary from life’s constant problems and fail to take the young couple seriously when they speak of love and hope for the future. Rolf Sohlman and Ann-Sofie Kylin are the young couple in love who try to rise above the clouds of despair created by their parents. A film that attempts to analyse the facts and fictions surrounding the discovery and eventual epidemic of the AIDS virus, funded by the Swedish Board of Health and Welfare to be distributed to schools, colleges and universities around the country. A black and white 1960s urban drama about the day a young Swedish man spends with his girlfriend, and anxiety’s intrusion upon it. A moving colour film that is somewhat sketchy scenes describes the morning activities of a tentative young pair of lovers. A minimalistic study of waking up on the wrong side of the bed, To Fetch a Bike shows two young lovers getting ready for a new day. All the short films will be screened together. Accompanying the screening of his oeuvre over the course of 3 days, the exhibition I´m happy to hear that your doing fine, which focuses primarily on material from the trilogy will be on display in the Nordic house Atrium.